Discussion Ideas, questions, etc, Post em here! Discussion in 'Console Modding 101' started by cheese, Oct 14, 2016. Hello there, I was wondering if I can I use the mii channel and access the wii home screen on portablizemii? Yes, you just move your cursor to the bottom and hit exit. Thanks for the quick response, that's good to know I was worried I might have had to say goodbye to the miis. Hey all. I just have some questions about making a portable Wii. 1. How big is a trimmed Wii motherboard? Can someone provide dimensions? 2. Can I possibly use a PS Vita housing or something like this (taken apart), since I don't have a 3D printer to make a case of my own? 3. If I can use a Vita housing, will the original screen work with the Wii? Or do I need a different one? Sorry, I've never done anything like this and I'm trying to plan it all out. If I use a Wii U gamepad shell, would that work better? Also, what is a spacer? Something to keep the motherboard from touching the shell? Sorry, noob here. Edit: is it possible to use the Wii U gamepad's screen? Or do I have to buy a different one from the link you posted? Sorry for all the questions. The Wii U gamepad shell is around as hard because it is very thin. A spacer is just a plastic bit that goes around the outside to make the entire casing thicker so you have more room inside. Okay. I already ordered a Wii U gamepad and I'll probably see about making a spacer. I'll just buy a new display then. Also, sorry again for bothering you, but do you have any tutorials on how to wire in a headphone jack? Or maybe someone's worklog that is indepth? Hey I have nearly finished my first portable, its simple and just runs gamecube games for now. I thought it was finished however after being on for a few minutes the wii goes to black screen. It loads portablizemii and games however after a few minutes it always goes to a black screen .It worked perfectly for long periods of time with portablizemii before the trim. Let me know if you need any more info to help. I would make a thread on this in the Wii section providing pictures and as much info as possible. What traces would I ... if any.... need to rewire if I cut this PCB in half for a portable project? any day I can promote my favorite youtuber is a good day. You'll probably have to map them yourself. This can be used as a reference for the pin numbers on the stock AV port. 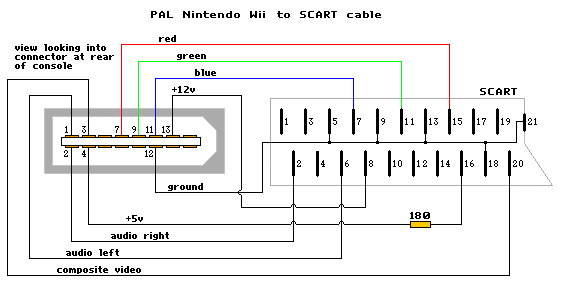 Just be aware that the RGB pins shown are for 480i SCART, not 480p YPbPr (component). The component pins are slightly different, you can consult the AV pinout in the Wii Trimming Guide for that. The pin numbers in the socket diagram and trimming guide match up. Is putting a trimmed Wii into the Wii U Gamepad too much of a stretch? I don't have a 3D printer, so using something like the gamepad shell is probably the best option for me at the moment. There isn't too much space in the gamepad, and I was wondering if a Wii can somehow be crammed into one. Hey, just joined and I want to make a "laptop" style portable out of an old famicom I got for cheap, I'm kind of confused just how you connect screens to consoles? I see a lot in the guides about getting composite outs from consoles, but how do you actually connect those to raw screens? Do you need driver boards?